Today was a busy day as I textured up the letters and sun and welded everything securely in place. 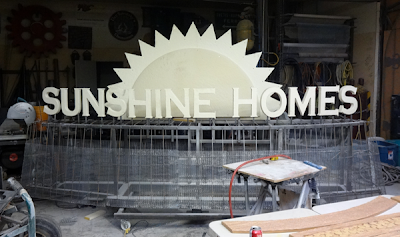 The top parts of the sign are now ready for paint. Now that the routed parts are in place I can finish the welding and we can add all of the galvanized mesh. Once that is in place we can begin sculpting the fiberglass reinforced concrete rock work. The sign is quickly coming together.